The Rubenstein holds the archives of the International Center for Transitional Justice (ICTJ), perhaps the single most important point of connection for communities who, in their desire to confront troubled pasts, have turned to the truth and reconciliation commission (TRC). The ICTJ archives reveal the workings of the global transitional justice crossroads, they spotlight an institution that carries forward the lessons, expertise, and experience of each commission to those that come afterwards. In the year 2000, for the first time since the British ceded political authority over the territory they called Gold Coast, Ghana experienced regime change by ballot box. Subsequently, Ghana’s TRC was ushered in by the newly elected New Patriotic Party (NPP) government. For about 18 months, glimpses, recordings, and debates about Ghana’s history of human rights abuse, as rendered by its citizenry, occupied the body politic. But fifteen years later, a lot has happened in Ghana— and frustratingly, much has remained the same. In the decade since Ghana’s National Reconciliation Commission (NRC) ended, offshore oil reserves in the country’s Western Region have been newly discovered, exploited, and are now flowing. A new colloquialism, dumsor, has been coined as a result of the electricity outages and power sharing which have inexplicably become de rigueur in 21st century Ghana. John Kufuor, the president who oversaw the formation of the Commission, has served his two terms as president, stepped down, watched his political party lose majority control of the presidency and the Parliament, and now spends his days fending off allegations about corruption. From today’s vantage point, the hopes attached to Ghana’s truth and reconciliation commission experiment seem quaint, aggressively optimistic, or misleading, depending on your political persuasion. The sheer difficulty of locating the artifacts of national reconciliation in Accra suggest that ‘Ghana’s TRC moment’ has long ended. It would be easy to dismiss the NRC as a frustrating political ritual, as all flash and no substance. That is—until you access the records of Ghana’s National Reconciliation Commission, many of which are preserved within the ICTJ archives. The voices are clear and cutting; they are as relevant today as they were when the TRC captured the nation’s attention. 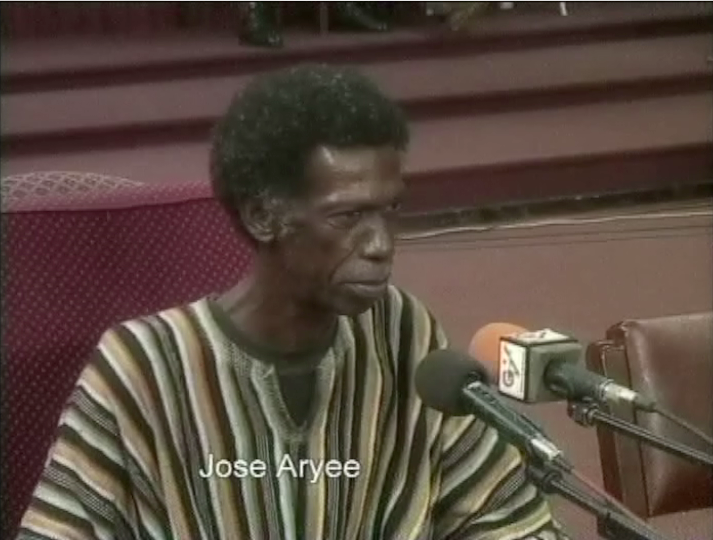 In the audio archive, I find the crackling somber tones of Jose Aryee, a journalist whose NRC testimony describes the public execution of former head of state Akwasi Afrifa in 1979. “Up to now, I shudder to think of what went on that day. I never was a fan of Afrifa as such. Neither was I a fan of any of those executed people. But the way they died, particularly Afrifa, it was sad. I, at that time, what went through my mind was, I would never be a politician in Ghana. Never. Not for all the gold in King Midas’s palace because… I felt that Ghanaians, we’re like Kwaku Ananse; that is the mentality we have…” In the Rubenstein, these critical musings and stories are preserved, and thrown out across space and time, again, in the hopes that they might be heard, again. And thus, the too-brief afterlife of the Ghanaian NRC is extended. Post contributed by Abena Asare, Assistant Professor of Modern African Affairs at Stony Brook University.